We ship all our canvas stretcher bars pre-assembled so you can get to work right out of the box. 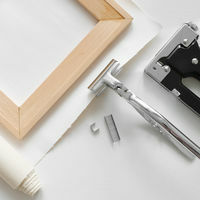 We join our bars using a combination of picture framing v-nails and strong wood glues. Wherever needed we build in extra corner braces, cross beams and other measures needed to support the canvas stretcher bars at no extra cost. The style and amount of extra support will vary based on your size and bar thickness but we'll always ensure that your canvas stretcher bar is strong and resilient. Choose from either 2cm, 3cm or 4cm thick stretcher bars to suit your canvas. Please note there is a +-2mm tolerance on the thickness of the bars. We include D-Rings and String for hanging in a small sleeve with all canvas stretcher bars. So you can add your hanging system in as soon as you're done stretching your canvas. 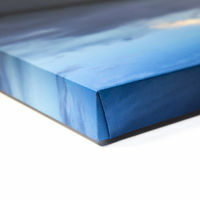 For large canvases we recommend not using the string but rather just the D-Rings facing upwards on each side. For any questions about hanging your canvas please contact us.